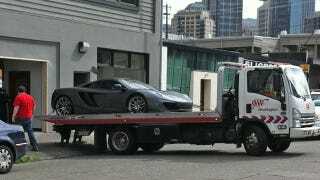 McLaren's $250,000 MP4-12C hasn't even begun to be built in volume yet, but it's already had its first wreck, and Seattle residents were rendered sleepless by it. UPDATE! "I was driving on HY-99 Northbound at about 1PM wondering why traffic was so congested. To my surprise I saw 3 Seattle Police cars and 2 DOT trucks behind a wrong way facing Mclaren. It turns out the rear passenger wheel was separated from the car." Another tipster, Dana, says the McLaren was housed in a nearby garage; a coworker was able to snap the photo above of the wounded McLaren returning home. Given how obsessed with detail McLaren is, this MP4-12C will either become a test mule for supercar mechanics or be given a Viking sendoff. Update: Another pair of photos from Quattroworld via The Daily Hoon.